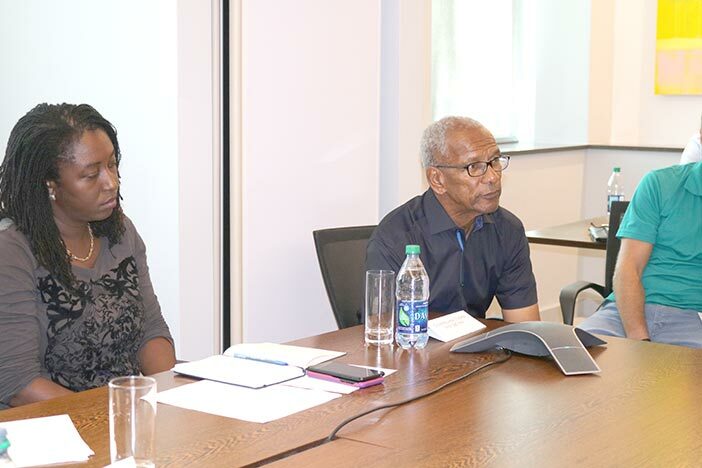 Premier and Minister for Finance, Dr. the Honourable D. Orlando Smith, OBE addressed leaders of the Territory’s financial services industry today at an update meeting hosted by BVI Finance. Premier Smith spoke to the group of leaders gathered at Ogier’s conference room, as well as those that joined in from around the world on a conference call. Acknowledging the diligence in the industry’s business continuity plan and the swiftness of its response, he said, “I’m very glad we have been able to be up and running and continue our service.” Despite the wide-scale devastation caused by Hurricane Irma, the Monday following the passage of the hurricane, the Territory was open for financial services transactions. 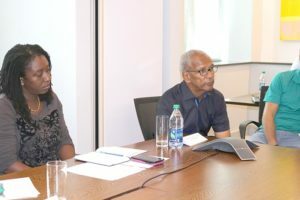 Interim Executive Director of BVI Finance, Lorna Smith, OBE, spoke of the urgency in which the industry has rallied together to ensure business continuity for financial services sector. “We are doing everything possible to make sure the industry remains solid and that the financial services industry remains in the Virgin Islands,” she said. To facilitate business in the financial services industry during this time, VIRRGIN, the industry’s online incorporation system is now accessible anywhere in the world. The Eastern Caribbean Commercial Court that is home in the BVI is presently hearing cases in St Lucia. Also, a new practice direction has been disseminated to BVI lawyers. The Territory’s Shipping Registry is also up and running, operating from the Ritter House, and the Financial Services Commission is open from 9:00 a.m. to 4:00 p.m. daily, providing premium services. The BVI is an internationally respected financial centre connecting markets, facilitating investment, trade and capital flow. The British Virgin Islands remains a world leader for excellence and innovation in financial services and is an essential element in the global economy. BVI Finance is the voice of the Territory’s financial services industry; marketing and promoting its products and services, as well as managing and maintaining the Territory’s reputation as a premier offshore financial centre. Established in 2002 as the BVI International Finance Centre, BVI Finance was re-branded in 2015.